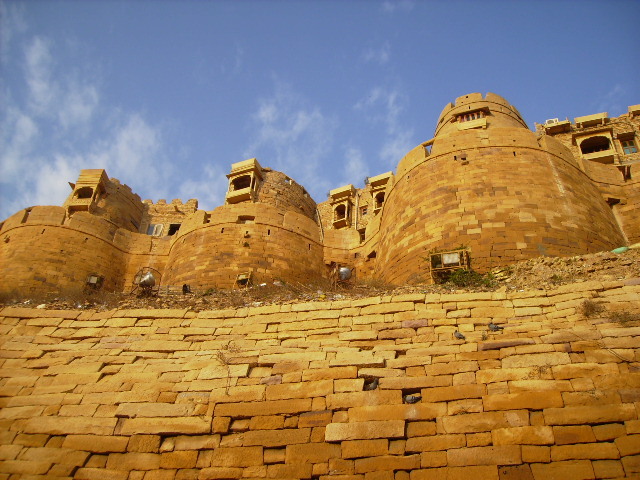 When we got back from our tryst with the desert, we were asked whether we were interested in going to the Jaisalmer Fort the next morning. I was shocked we were even given a choice! “Of course we want to go!” I blurted out before the naysayers could get in a word otherwise. My professor, thankfully, heartily supported my view and we were told what time we would leave the next day. The next morning, chaos ensued, as some confused souls got up at the crack of dawn but then roamed about trying to decide whether or not they wanted to go. The others who were pretty much certain of wanting to go, were, of course, adding to the madness. We’d gotten rooms along two corridors on two floors of the hotel. So, all the doors open, girls groggily emerging from under tangles of blankets or fighting to get into the bathrooms. You know…the usual. But we did eventually manage to make our way out after a quick breakfast. 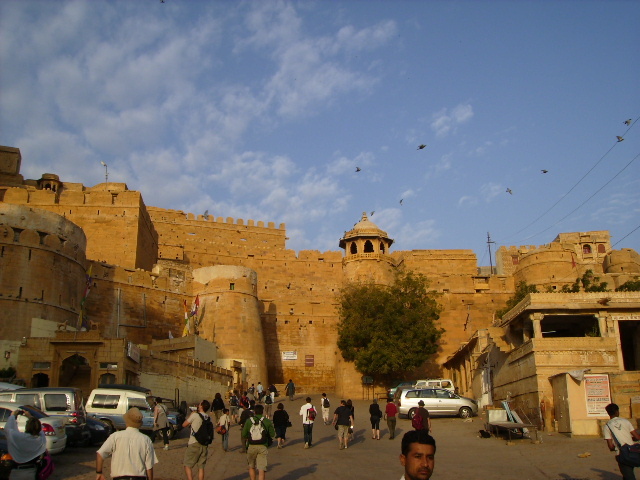 The Jaisalmer Fort is one of the few living forts left. That means people actually live within the fort premises. Wow. Nice neighbourhood, huh? Well, the fort was really wonderful. We roamed around. People were going on with daily life as usual as we gazed up at the towering structures. 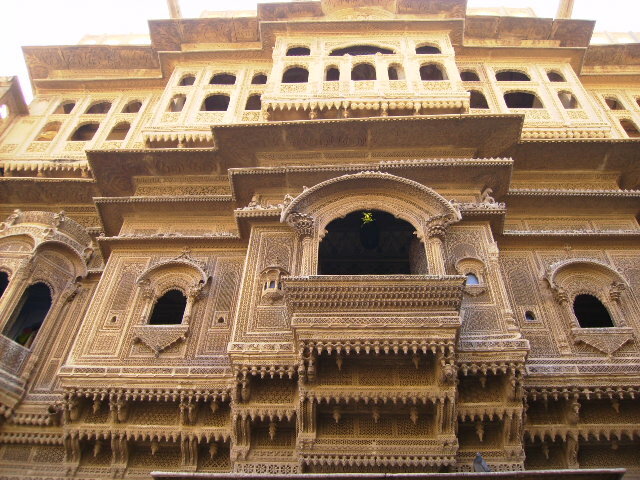 The Jaisalmer royalty were a sun-worshipping clan, so we got to see some signs of that. 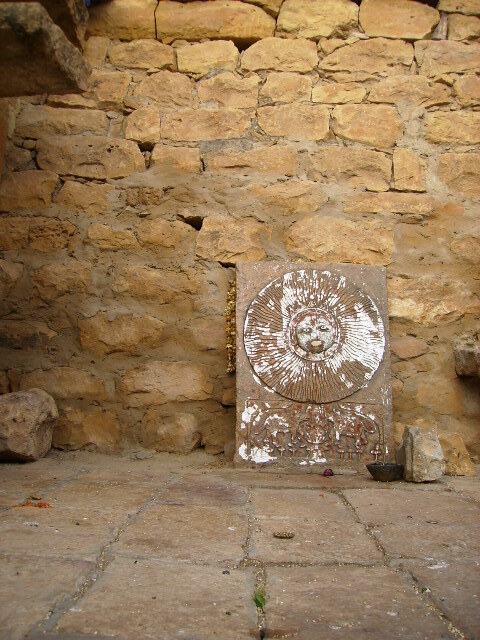 There are a few temples inside the fort, including a Jain temple, set up by the Jain traders who kept visiting the fort. It’s got some fabulous stonework! There’s one more place you must go to inside the fort. It’s been already made quite well-known by the TV show ‘Highway on My Plate’. 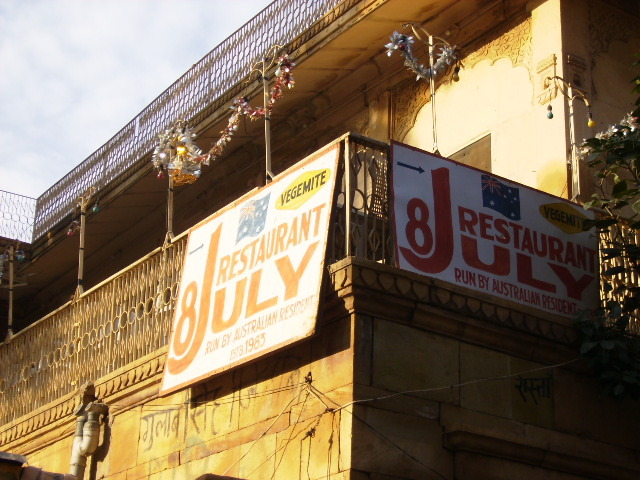 It’s a restaurant called ‘8 July Restaurant’. DO NOT miss out on their Apple pie and ice cream! We were, of course, also led up to the ramparts of the fort. The view was, needless to say, breathtaking. 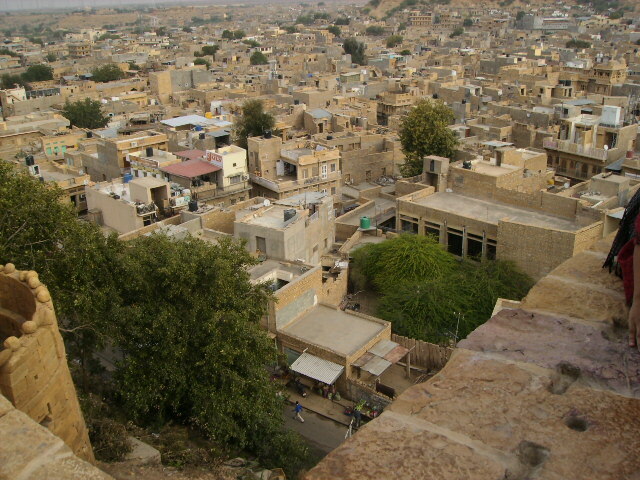 After we’d all “Ooh”-ed and “Aah”-ed at the view, we were led back down, out of the fort premises, and we plunged right into the narrow lanes and by-lanes of the bustling town situated all around the fort. It’s quite dirty, cows and dogs being treated with a high level of respect here. 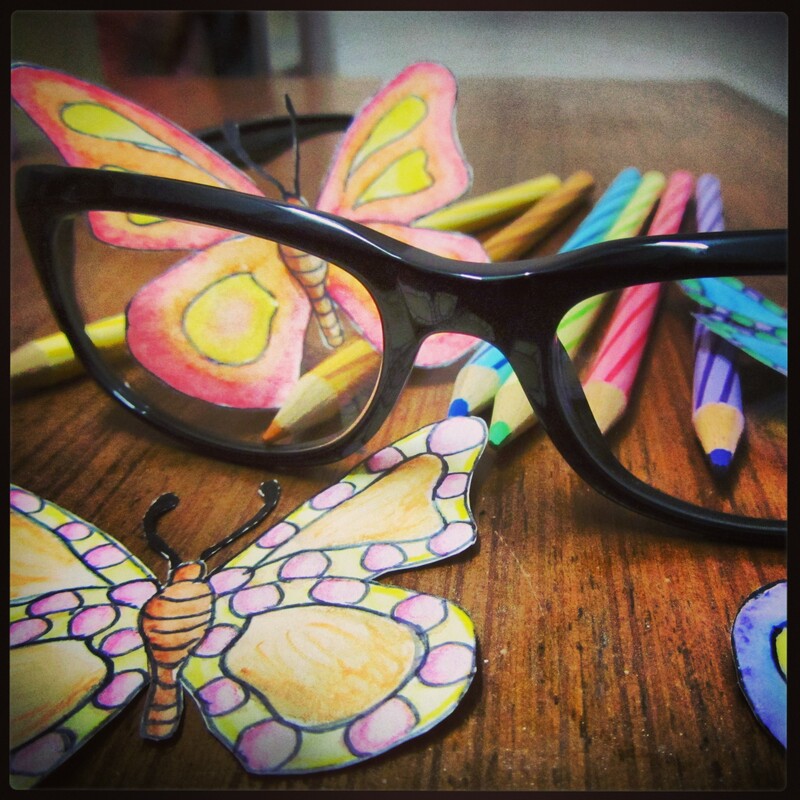 But you feel like you’ve entered this different world. The houses all around you are just as interesting. Each house has a sort of signboard painted on it’s front walls. It displays the names of the people living in that house, who’s married to whom, when they got married, when there children were born, how old they are and so on. Our guide explained to us that because every life event was documented in this fashion, these signs had to be, obviously, repainted with every life ceremony you went through. I was so fascinated on seeing this absolutely new kind of social practise, that I forgot to take any pictures. I haven’t cursed myself less for that ever since. These narrow, slightly claustrophobic, slightly dirty and extremely interesting streets also contain many old havelis. 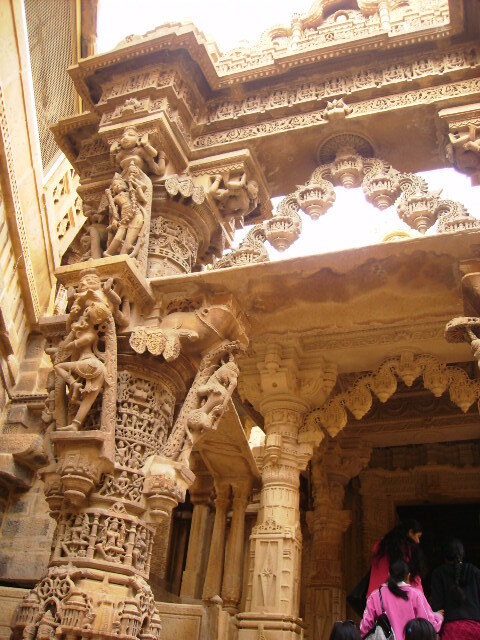 We visited two in particular, these being the biggest and most well-maintained ones till date – Patwon Ki Haveli and Nathmalji Ki Haveli. So after hastily clicking a few pictures, there we were again, stuffed into the bus. After this, we basically went back to the hotel, packed up our remainin stuff, forced new items (read : shopping, souvenirs) into suitcases and backpacks somehow, searched out (or almost forgot) phone/camera chargers, checked the bottles of water, packets of nibbles and clicked the tiny locks into place. 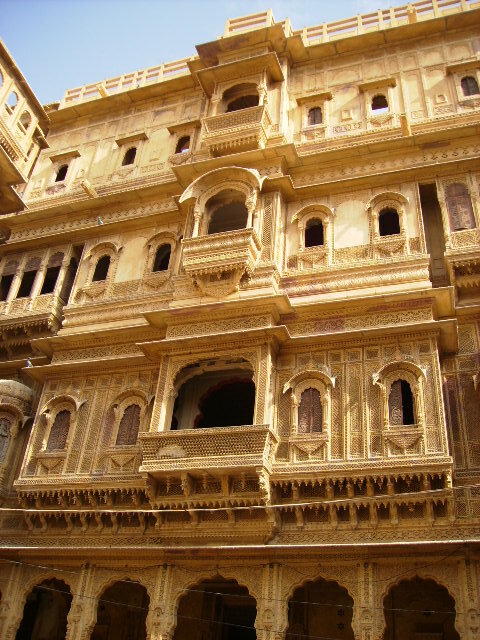 We were ready to leave Jaisalmer after a quick lunch. On the bus again. This trip was I guess the quietest (barring the early morning trip or the ride to the sand dunes, at both of which times everybody was just too sleepy or in fact, asleep) because it somehow heralded the end of our trip. 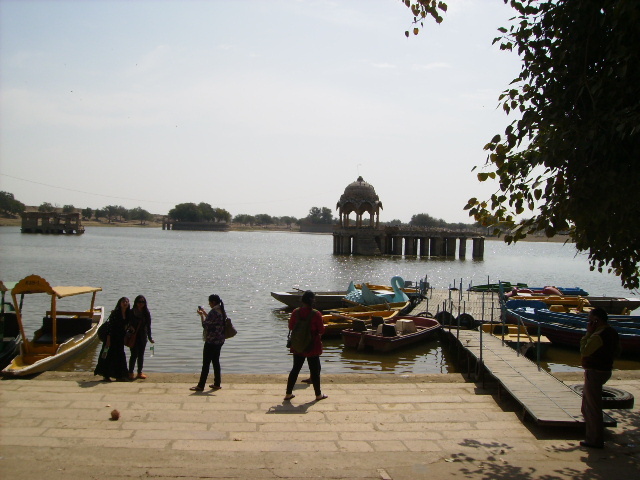 We were to catch a train back to Delhi from the Jodhpur railway station. So, very soon…too soon, there we were back at the Jodhpur station. We were quite tired out, but still joyously calling out to each other. Going on a trip together gives you this sense of camaraderie which only classroom and college interaction don’t bring. We had learned to take care of ourselves and of our friends. For me, it was, as Anne would have called it, an epoch in my life. My first trip sans family was over. And I’d had an awesome time. The train ride back was much quieter than the ride into Rajasthan. We just chatted quietly about the trip, laughed over hilarious incidents, “Oh-my-gosh”-ed over scandalous discoveries and basically tried to bring a certain kind of closure to the last few days. We reached the Delhi Cantonment Railway Station, greeted by eager family. The trip was over.